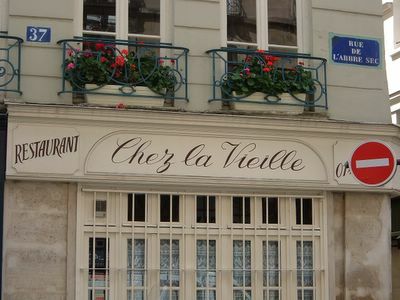 Chez la Vieille. Is the stop sign referring to the restaurant? Mom's last full day with me, we decided to treat ourselves to a special lunch. Thinking ahead to this week, I remembered Dine and Dish #2: Queen of Cuisine, hosted by Sarah at The Delicious Life. Mom and I had both read a lot about Chez la Vieille-Adrienne in Patricia Wells' tome on food in Paris. It also got a great review in Time Out Paris (which I've decided hates virtually everything), so we decided it would be great. 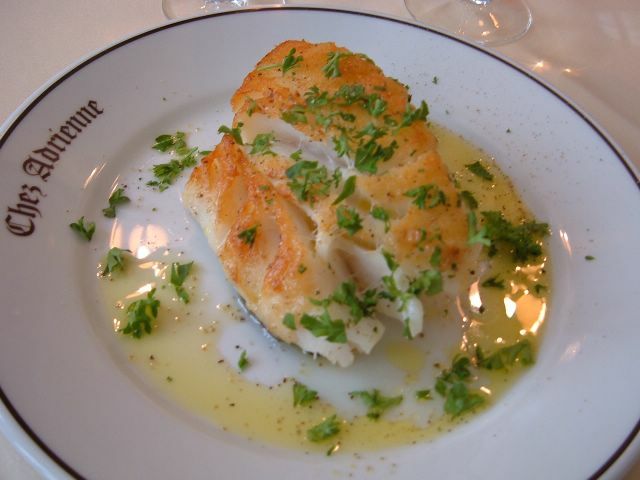 It was run by Adrienne, but she has since retired and been replaced by the Corsican Marie-José Cervoni. Both Mom and I are quite fond of Corsican food, so we were really looking forward to the new influence. I don't know if it was an off-day or what, but Chez la Vieille did not live up to any of our expectations. First, we walked into a deliciously smelling room downstairs and were quickly herded upstairs to what Mom referred to as "La Salle Americaine" as the only other diners there were an American couple. This room felt colder and more formal, though maybe that was just my imagination. Of the three starters offered, the only one that appealed to us was the chariot, a general selection. Mom doesn't eat mammals, so we asked what was on the chariot. 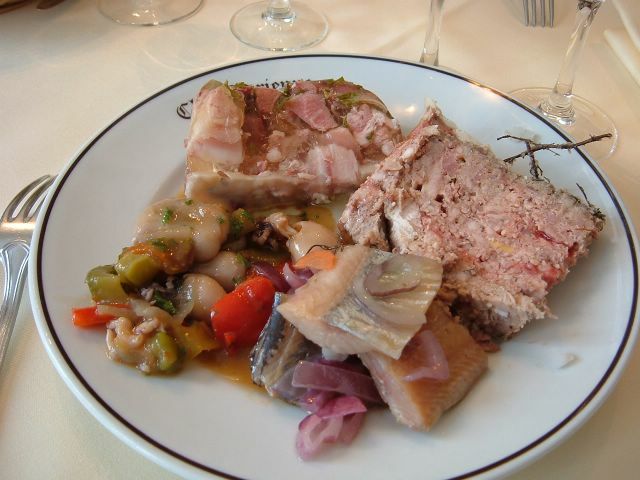 "Fish and pate," the waitress quickly responded. She brought us each a plate, mine with two kinds of fish and two pates, Mom's with just the fish--not more fish than I had, mind you. The Pates were both pork-based and smoky tasting. The First was good, if a little salty, and large sprigs of thyme were placed on it. The Second was also smoky tasting, but placed in gelatin--not my favorite ingredient. In fact, I wasn't able to finish it. The first of the fish was a Squid and Calamari salad with red peppers. It was a little oily for Mom's tastes, but I liked it. Rather plain tasting, but not bad. The second was Herring with Red Onions. This was also swimming in oil and so salty I couldn't finish it either. Normally in France when someone doesn't clean their plate, the server is concerned and asks if everything was OK. Our server didn't even appear to notice. In fact, she came over several times while we were still eating to take our plates away! Main dishes were better. 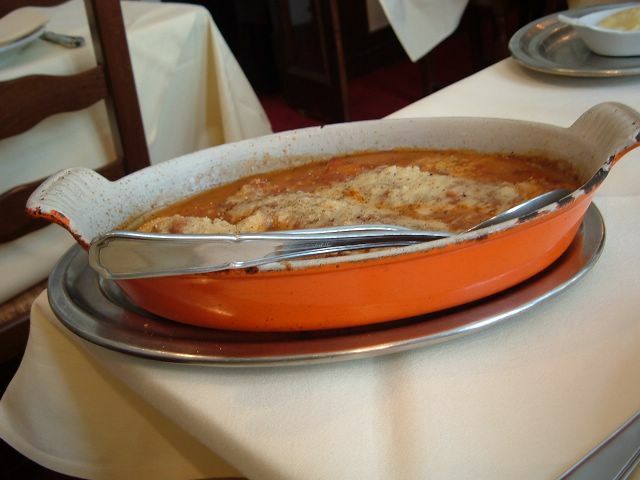 Mom ordered the celebrated Cannelloni au Brocciu. 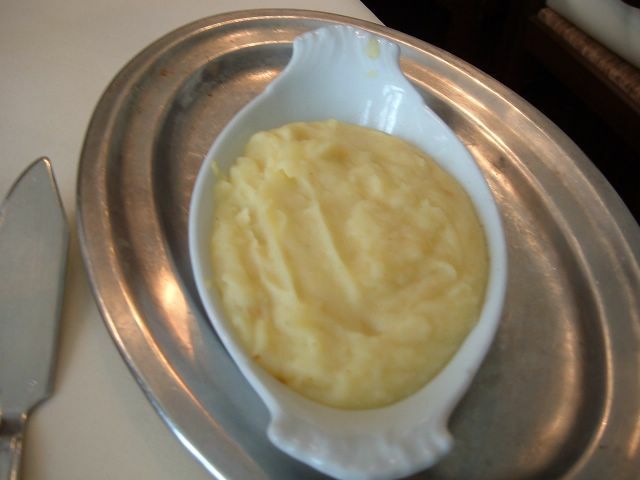 Brocciu is a delicious Corsican cheese. The cannelloni also contained spinach and mint. They were very reminiscent of manicotti and were in a spicy tomato sauce with parmesan grated on top. The sauce wasn't so spicy it over-powered the cannelloni but rather enhanced the fresh taste of the mint and spinach. Mom find it slightly salty, but I liked it. For my main dish, I ordered the Fish of the Day, which was cod. It was lightly breaded and sprinkled with a healthy amount of parsley. It tasted fresh and simple and I liked it a lot. It was adorned with a light Butter and Black Pepper sauce. Nothing spectacular, but good, fresh food. My fish came with a dish of Potato puree that was delicious though a little salty (notice a trend?). There was so much butter in the potatoes, though, that how could they not be good? For dessert, we decided to split the Chestnut Flan. We both love chestnuts and something custardy seemed like a good end. 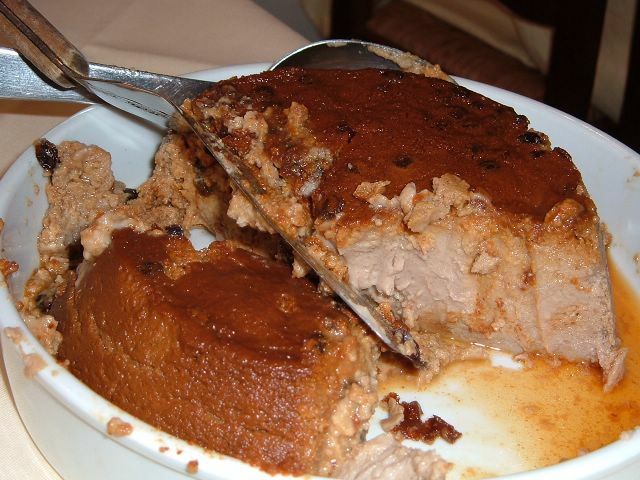 We were presented with a giant dish of flan. I assume we could have had as much as we wanted, but we were content with two small slices each. It was heavy, quite sweet and a little too alcoholic tasting. One piece was certainly enough. I don't know what happened when we went to La Vieille, but it was nothing like the reviews we had read. We tried our best to like it, but just couldn't. I must say we were quite disappointed and will most likely not return. hopefully next month's adventure for dine & dish will turn into a better lunch or dinner for you! Sarah, I admit I am sensitive to salt, but this just over-powered the natural taste of the food--instead of enhancing it.